I love Eleanor Oliphant. An introvert who dismisses the norms of society and social interactions. A woman who likes to speak her mind and mean precisely what she says, and expects other to do the same. Simple Eleanor Olipahant. What people failed to see in Eleanor, and what Eleanor kept quite hidden from the world, was the scars of her childhood. The physical scar, that she didn’t hide nor did she try to. It was a badge of honor, the evidence of survival. She never did understand why people would shy away from shaking her hand, as if it was something that could be transferred to another person. Oh Eleanor, you have so much to offer this world, if you only knew. Eleanor Oliphant had a tragic childhood that made her outlook on life a little different than most. Moving from foster home to group homes to foster homes only solidified the need to be self-sufficient. She doesn’t talk about her past, well she doesn’t really like to talk much at all. Eleanor cross paths with an IT guy from work named Raymond and together they assist an elderly man named Sammy when he had a bad fall. That single encounter set Eleanor’s perfectly orchestrated life into a spiral of social interactions and meeting new people. On top of her new found social calendar, Eleanor falls for a musician. Her hope is that this one man she doesn’t even know will be the one that saves her. What she didn’t realize, was that she could save herself. Eleanor taught me that it’s okay to ask for help and to rely on our friends when life is really hard. She taught me it is okay to myself, scars and all, and embrace life on my own terms. She taught me that it’s okay to be awkward and give a dang about what others think, as long as I am okay with who I am. The friendship between Raymond and Eleanor is a beautiful, platonic relationship that shows that we just need the right kind of people to pick us up and not run away when it’s messy. Although, I was rooting for the two of them to take it to the next step. If you get a chance to listen to the audiobook version, it is amazing. The narrator nails the Scottish and British accents perfectly and it really adds to an already rich story. 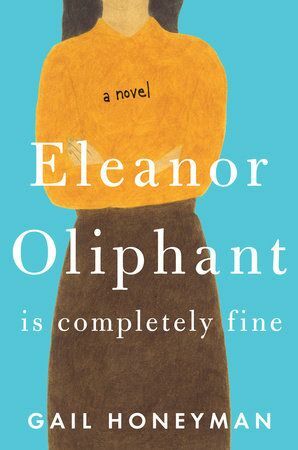 I promise, you will fall in love with Eleanor Oliphant.